Jen and I did a ‘burn and turn’ this afternoon to Hong Kong – we left on the 4:30pm ferry right after work, shopped (purchased the cutest trouser jeans), and then returned on the 8:20pm ferry. So on the way there, as we chit chatted away, this random guy approached us. The first I noticed was that he stunk. And by that I mean he had really bad breath. He then incoherently spoke to Jen in Chinese about going to Taiwan and needing $5,000 US dollars… we couldn’t really tell. We both informed him that we weren’t interested, but then he sat down in front of us and gave the same spiel to another girl. 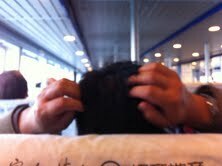 As we checked to make sure our passports were safe, we witnessed one of the grossest things ever. He started scratching his head. This seemed innocent enough at first, but the thing was, he kept scratching it, like really scratching it. Both Jen and I looked closer and we were horrified. 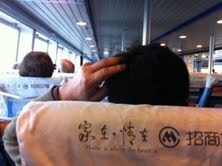 Not two feet in front of us, we saw tiny scabs and bits of blood on this guy’s scalp. I have never wanted a face-mask and a can of Lysol more in my entire life than I did at that moment. Now, pre-China Claire would have sat there and just dealt with it. But living-in-China Claire looked at her BFF Asia and said, “We are moving seats.” We picked up our bags and reseated ourselves across the ferry, without a tinge of guilt. On the bright side, at least we weren’t on an airplane! I am glad you learned “that” in China is nothing else. Yikes, the whole story makes me itch all over. I’m scratching my head trying to come up with an appropriate response to your most recent China adventure, but to no avail. It’s probably best to just let it ly.